For photos of previous years, please see the Menu on the left. Southern Regional Rambles. Linwood Loop, New Forest, Hampshire - 30th March 2019 Another lovely day dawns for our ramble around the Linwood area of the New Forest. We had 9 booked to come so a good crowd plus we were pleased to welcome Suzi Shilling from the National Park Authority who was coming along to see what we do, how we organise the rambles, and what people get out of getting out into the countryside - as we all know, it makes a world of difference to our mental wellbeing. Some of her findings will appear on YouTube and when it does we will send the link so DR members can have a look. We parked at the iconic High Corner Inn pub down the end of a stoney, bumpy track. 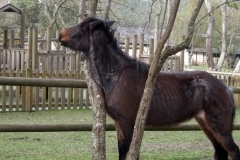 It is set in a remote part of the forest, when we arrived it was really quiet with just the birdsong to listen to plus two ponies in the car park having a scratch on the trees and fences. By the time we got back for our meal at 2.30 it was swamped with people all enjoying the lovely sunshine, its remote position in the forest doesn’t put anyone off in the slightest!! We set off through the reasonably gentle tracks passing great tall pine and deciduous trees, a little later in the month this area is a sea of bluebells and is extra beautiful, strangely, the NF only has a few places where bluebells are abundant, probably due to the dense canopy of trees which prevents the bulbs from getting the sunshine etc they need to produce flowers. We stopped for coffee at Splash Bridge, a pretty little place over a stream which is a favourite of ours. Then off up a sandy track to reach a higher path leading us onto the next leg of the ramble. Here, we had a hitch! One of our newest members had great faith in his rather small scooter + all terrain tyres being able to cope with the sandy track (we had already expressed doubts but decided to take his word for it!). Sadly, it just didn’t happen and the little scooter stubbornly refused to go through the sand so consequently, Bob escorted our disappointed member back to the car park as one feels duty bound to make sure anyone attending our rambles is delivered back safely to the destination. We went on slowly, and eventually Bob caught up with us again, but of course the double trip does have an effect on the bigger batteries too and they were quite depleted by this time, however, all was well and Bob did finish the day without any trouble on his trusty Supersport! 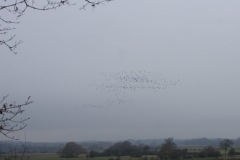 We had hoped to see deer as we did on the reccy, but not one appeared all day, always happens. The rest of the ramble went without any problems - just a lovely relaxing day through lovely parts of the forest and then back to the pub for a meal arriving there at the allotted time of 2.30pm where we all enjoyed a very nice meal outside in the sunshine. Suzi was able to do some video-ing and interview several of those attending for their comments on how being outside with DR helps them and we were pleased to welcome her along, especially as she made us a batch of “Rocky Road” tray bakes to keep us going. Delicious!! Thank you all for coming, without you all it would be a lonely ramble! Bluebell ramble on the 26th April - just let me know you want to come and directions etc will be sent out about a week before. 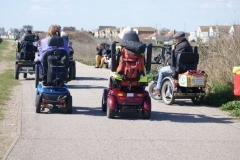 Don’t forget, if you have a ramble you would like to put on for others to share please let one us know via paula@disabledramblers.co.uk and we can help you to organise it. Val and Bob. Widewater to Worthing Pier - 25th March 2019 Couldn’t believe our luck!! A really beautiful day, a little nippy to start off with but soon warmed up and showed the coastal scenery off to full advantage. 7 of us left from Widewater Lagoon - this is a man-made feature which lies south of the Brighton Road between Lancing and Shoreham. Hidden from view by houses along the road it is a landlocked brackish lagoon (approximately 1 km long but narrow) bordered on its south side by the sea defences and shingle beach. Water levels rise following high tides and heavy rainfall, but the varied levels produce a unique area for plant life and a resting place for a variety of birds including herons, swans and other wildfowl, plus an egret when we were there. “Brackish” sounds a bit dismal, but it’s actually very nice and interesting with lots of birdwatchers arriving with their ‘scopes and ‘bins. From there along the Prom towards Worthing - on our left out to sea we had a good view of the Rampion Wind Farm, 8 miles offshore and with 116 turbines which supplies 350,000 homes, which has recently been completed, with some controversy (as usual), it looks quite impressive from the shore. En route we dropped in to Brooklands Park where the boardwalk across the lake has been renewed allowing us to try this out, there is also a golf course, playground, accessible exercise equipment and walks. More improvements are in the pipeline to bring this nice little park up to date including a new cafe in due course. Onward to the Pier - and Harry Ramsden’s!! Bob went and got some of us some delicious chips and we went onto the Pier to survey the view and enjoy our lunch. From the Pier you can see the whole coastline as far as Seaford Head and the Seven Sisters white cliffs, and Brighton and its new i360degrees viewing pod from where there is an excellent view of the South Downs and the Sussex coastline. Worthing Pier was originally built in 1861 but after a series of disasters over the years, such as storm damage, fire and general neglect it was finally rebuilt in 1949 and continues to be a source of enjoyment for residents and visitors to Worthing with cafe, amusement arcades, night club and theatre. Along the length are windows where artwork is etched into the glass, or coloured glass pictures have been made of commemorative events etc making a very colourful display as well as offering some shelter from the wind. After lunch we wended our way back to our starting point taking in all the things we had missed in the morning, it’s surprising what you see on the return journey of a linear route - I never find them boring as it all looks different going the other way - if you see what I mean! All in all, a very good day - quite a long ramble 9+ miles, but it didn’t seem that long at all. We hope to do another one from the opposite direction later in the summer, that is, from Ferring to the Pier a trip of about 7+ miles and totally different. Thanks to all for coming, and to Brian for his local knowledge and help. Val and Bob. Southern Regional Ramble - Burley Byeways - 25th February 2019 We were so lucky to choose this day as it was within the timescale of the record breaking temperatures for February and was really warm with perfect blue skies. 9 of us met at Burley, plus 2 walkers (so helpful when it comes to gates and cakes! ), with a great assortment of scooters: 3xTWS, 2x4 wheel Trampers, 1 Breeze 4, 1 large Pride with dual motors, 1 Hillclimber with dual motors, 1 TGA Supersport, with this interesting ensemble we set off through the little village of Burley, with its reputation of witches and ghouls, and through a little wood which leads onto the open forest where we took the track which was a new route for us, the whole ramble is only 4 miles in total but just right for a winter event, with a pub lunch at the end. The track led us over Turf Hill and we hadn’t realised it was negotiable for us until we reccied it during January finding it to be really super with lovely views plus a few challenges as well, these being some steep downhill slopes with a loose, stoney surface and various ruts which presented a few problems for some, but these were soon overcome without being overturned!! This track led onto the disused railway line which runs from Burley to Holmsley Road Station, although straight and flat it has some lovely scenery along the way. From there we go up a quiet forest road, much of which could be navigated on the verges, which also gives some practice on how to drive your scooter over the bumps and furrows along the way! Progressing onto a green area to take us a little further up the main B road to cross away from the brow of a hill leading out of Burley, not a good place to go over the road as visibility is very limited and traffic is fast, so this little diversion helped a lot. After crossing we take the route along Cott Lane, a lovely little hidden track which emerges next to the cricket pitch at Burley, from there it’s across the road and into the little wood, taking us back into the village centre. Burley is quite a fascinating place with lots of little quiet lanes and tracks and you can spend a pleasant afternoon with your ViewRanger going round these lanes and exploring. We then went into the very nice and convenient pub called the Queens Head and had a really tasty lunch, a very good ending to a super day. Pleased to welcome Gary & Lyn and hope they will become members in due course. Roy’s friend Lyn brought along a lovely selection of cakes for our coffee break which was very much enjoyed by us all. Now looking forward to the next rambles in March. Thanks to all for coming and making it such a super day. Val and Bob. Southern Regional Ramble - Downs Link Section 2 - from Partridge Green, nr Horsham, West Sussex Dry, but dull, start from an Industrial Estate in Partridge Green in West Sussex. We had kindly been given permission to use one of the business’s car park for the day, people are surprisingly co-operative when you phone up and ask if you can use their premises, there is a lot of good will about and it’s always appreciated. We had 7 scoots and 1 walker and 2 dogs for the day, and very pleased to welcome new member Simon, his wife and their little dog, Holly. Much to our astonishment Simon arrived in an SUV and out of it came a Tramper TWS! Specially adapted with fold down handlebars and a special lightweight seat so that it would go in, Beamer worked their magic for Simon so he could keep his much loved car. We were amazed and impressed, to say the least. The Downs Link is a disused railway that runs for 37+ miles from Shoreham in West Sussex to Martha’s Hill in Surrey, it is very varied and with some superb scenery on all the different Sections. This was Section No. 2 and passed through lovely open countryside, much of it was wetlands and brooks with all the appropriate birdlife. A flock of Widgeon rose from one of the lakes pursued by a bird of prey, Roger our resident bird expert thought it was a peregrine falcon, it was a lovely sight although they were some distance away. There was also some enclosed “tunnel” like parts, and even a little road work through the little village of Henfield. A very suitable route for the winter as it is mainly flat and on a good track. It is a linear route, ie “there and back”, but personally, I never mind that as it all looks so different when returning and you see lots of things you may have missed on the way. En route we passed a gun pill box from WW2, still in good repair but without it’s gun! It is a popular route with cyclists in their lycra and all day we were pulling over and what a good natured lot they were, without exception. Very polite and cheery. Sadly, we had a puncture, we tried pumping it up with no luck so Roger, who is one of the most experienced ramblers and spends his life on the South Downs covered in mud, opted to ride it home as was and we got back without further incident and it had all stayed intact, just flat! We kept a close eye on it and it wasn’t coming off the rim or anything equally awful. Added to that, David (our Leader) had trouble with his battery - it was flashing practically all the way back but again but with a bit of a help up one hill he made it safely back to base. All adds to the excitement. A very good day, not too cold, no rain and plenty of good company - a lovely way to spend a February day and to know that not too far away Spring is just round the corner and before long all the wild flowers will be making an appearance once more. 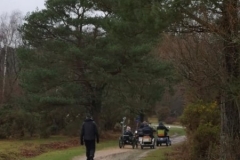 Many thanks for all those who came along and made it so enjoyable, and to David for all his research into this project and who led this ramble on behalf of DR.
Southern Regional Ramble - Hatchet Pond to East Boldre via Turfcutters Arms, nr Beaulieu, New Forest. - 19th January 2019. What a forecast!! Rain showers all day and cold, it put 4 of our valiant members off but as we were leading the ramble we had to show up, so in the end it was 5 of us plus 2 walkers that met in the car park in light rain, but miraculously, within half an hour of arriving - and before we left for the ramble - it stopped and kept away all day. This was such a relief to us all and we set off up a quiet lane opposite Hatchet Pond to make our way through lovely woodland tracks for the first part of this 5.5 mile winter ramble. 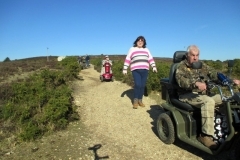 Strange thing was, we had 5 different machines - a Tramper, Supersport, Boma, Breeze 4 and Mayan - plus Sheila on her mountain bike and Pete on foot. En route we met a large family gathering on bikes with a lot of very little children, also on their little bikes, having a great time in Hawkhill Inclosure and making the most of whizzing up and down the hills. We were pleased to welcome Derek, a recent new member who lives near the pond and so met us there on his Breeze 4. Coming out of the woodland we went onto a good tarmac track across open heathland, there were quite a few ponies about making the most of the gorse flowers that were out in abundance. Upon reaching a quiet little car park we had to then go onto a much wilder path that wends its way across more heathland - this was the “problem” bit that we were worried about as we had a feeling it may have become extremely muddy with the recent rain over the preceding few days. It was, indeed, very wet and quite muddy but we all coped with it with no problem and on the way met a horse rider whose mount was obviously convinced we were up to no good, however, we stopped and she brought the horse over to us and it obligingly had a look at Paula in her Boma and snorted in a very friendly fashion! Bit disconcerting for Paula as she was low down and the horse towered over her, but it was a good way to introduce us to this particular equine. We had a nice chat and continued on our way over the marshy, wet heathland to the village of East Boldre and our destination for lunch at the Turfcutters Arms. This was heaven! We were quite cold by now, and as we entered the pub we were greeted by a lovely rush of warmth and the sight of a super open fire - this is a typical New Forest country pub and they welcome dogs and walkers etc with no quandaries. We think it is a very old pub as you can see from the photo of one of the quaint signs inside. We went in and had a good warming lunch and hot drinks, it was just what we needed. Suddenly, it was 3 o’clock and so we had to depart for our short journey back to Hatchet Pond about half a mile away. This is a really nice little ramble and perfect for a winter trip and to take in the pub en route. We would like to thank all who came, and to say we missed those who couldn’t make it, but hopefully, next month we will have another New Forest ramble also visiting a pub for a meal and warm up. Thanks all, Val and Bob.